Netgear Orbi is the way of the future when it comes to the VA-Fi as we know it. 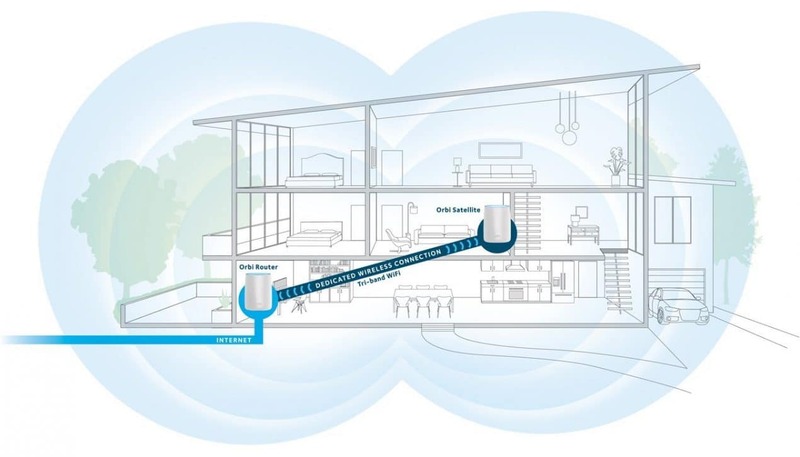 With an Orbi, you will never have to worry about Wi-Fi dead zones in your home. The NETGEAR Orbi Home WiFi System is a complete Wi-Fi System. With big coverage up to 8000 sq ft. Formally mesh systems were only for commercial use and very expensive but now there are reasonably priced systems available that are ideal for large home coverage. If you compare it with a traditional router, the Netgear Orbi is basically two routers working together. Because the second router is an extender this device manages to stretch Wi-Fi coverage like no other router you know without diminishing its speed. 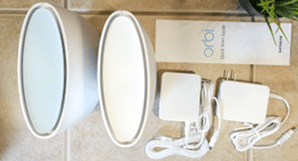 Let's have a further look with our NETGEAR Orbi Home WiFi System Review. As far as this specific model, the AC3000 is concerned; it is the most powerful version available with the ability to cover up to 5,000 square feet with its signal. They have a number of models to fit any home size. Start with a two pack and you can add up to 8 units for a whopping 8000 square feet of coverage. The Netgear Orbi is special in comparison to other similar products because of the way the two units are connected. The second unit or the add-on satellite uses a dedicated Wi-Fi to connect to the first unit, the main router. The other similar extenders, on the other hand, use the same band that they are broadcasting which results in a signal loss of 50 percent. In order to remain stable and provide consistent coverage, this separate 5 GHz band with a top speed of 1.7Gps is only used to connect the two units and for nothing else. The speed will only be diminished if you start using more than one extender. As you can instantly notice, a lot of work was put into the design of the Netgear Orbi. In this case, we can truly say that less is more. It consists of two units almost identical in sleek, minimalistic design with a soft white finish. Some would argue that because of the design, this device can have some setbacks in comparison to the competition. While the Orbi's antennas are packed inside the housing, other similar products have decided on external antennas for maximum performance. But the initial main goal of this device was consistent and far-reaching connectivity, and in this aspect, it serves its purpose perfectly. The well known, feature-specific lights which we are used to on most routers have been declared obsolete on this model. This can be somewhat difficult when trying to diagnose a problem. The only indicating lights that you will find are placed on the second unit. On the back, you will find one modem input (WAN) and three Ethernet port which are dedicated to your wired devices. There's also a USB port, and power and reset buttons. The satellite unit is more or less the same, but instead of the WAN port, there's a LAN Ethernet port. Setting up the Netgear Orbi is fairly simple. The first thing you need to do is connect the first unit, the router to the Internet source (Your modem) and turn it on. The second step is to place the second unit at a distance from the router and then turn it on. And that's it. But not quite. You should be careful where you put the second Orbi add-on unit. Avoid signal paths with brick walls and metal appliance. Remember Wifi signal travels at a line of site and if the second Orbi unit is placed too far away or behind any absorbing materials this will cause the second Add-on unit to perform poorly or not get a signal at all. If you, on the other hand, place it too close, it won't be able to cover your whole house with the signal. Since your internet source is probably coming from one of the corners of the building, that's where your router will be. Try to find a spot in your home that is central and receives the full signal of the router. Since the satellite unit has indicating lights on it, you'll be able to locate the best spot in your configuration. This is nothing new and will be pretty straightforward if you previously had experience with any router that has a web interface. You just need to visit the routers default IP in your browser and from there you will have all kinds of settings and adjustments. You can, of course, change the name and password of your Wi-Fi, but with Orbi you get more options than before. You will be able to manipulate access control, set up parental control and play with other options like port forwarding, beamforming, and others. You have to be aware that Orbi is not the fastest Wi-Fi system on the market but that has never been its ambition. The NETGEAR Orbi Home Wi-Fi System: AC3000 Tri-Band Home Network' with Router & Satellite Extender can cover up to 5,000 square feet of space and bring the signal to every corner of your big house, and that's exactly what it does. It has a top speed of 877Mdp with a 5GHz band which is okay but nothing to brag about. But that speed will remain constant even if you put two brick walls and a concrete floor between you and the router. The most important thing is to find the sweet spot for the add-on satellite and any building up to 5,000 square feet will be covered with constant Wi-Fi. Also, it is interesting how good the hands-off mechanism makes your life easier using this system. If you move constantly around your house, the system will have to switch the signal from the router to the satellite and back depending on your location. It is so quick and smooth that you will never feel the transition let alone lose the connection. The NETGEAR Orbi app makes it easy to set up use your Orbi devices. Quickly install and configure your Orbi network. Connect your mobile device to the default Orbi WiFi network, and the app walks you through the rest, step-by-step. The app shows the status of your devices and provides links to helpful support information related to your network. In this NETGEAR Orbi Hom​​e WiFi System review, we have tried to show you all the benefits and flaws of the system. If your house does have dead Wi-Fi spots you don't need to look any further because Orbi doesn't have any issue with coverage. However, if the space you want to cover requires an additional satellite unit, you can always add it anytime. If coverage is not your main concern and speed is then the NETGEAR Nighthawk AC1900 Dual Band Router might be a better choice if the majority of the time you are at close range. With the NetGear Orbi, everyone in the house will have a strong consistent connection, But it is a little slower than other routers at close range. The device might be a little pricey, but as you can see, it comes with all the premium features you will ever need in a router. Which Wifi Router is Good For Me?